Holy shitake mushrooms, you’re on the waitlist. Stop thinking the waitlist is MBA applicant purgatory. In this post, I empower you to spring board from the waitlist and learn from a person who loves, loves, loves the waitlist: me! Let me repeat that in case you just fell off your futon. I love life’s waitlists. I love being on the waitlist for a VIP SuperBowl party. I loved being on the waitlist to blog here at Business Week. I even love being on the waitlist to date my next girlfriend (yeah she currently has a boyfriend). Heck being on a waitlist is almost a life motto for me. It started when I worked in sales and a technique I pioneered called “Second Supplier Gambit” (SSG). In short, it says that if you’re the #2 vendor or supplier long enough, eventually you’ll be #1. Enough with the strategy and drab history into my dating life…, here are specific time-tested tactics that took a dozen years to perfect that you will get in a twelve minute read. 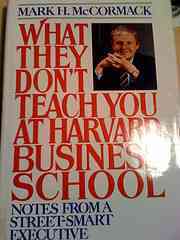 My mentor, Mark McCormack, navigates wait lists in “What They Don’t Teach You At Harvard Business School“. Seven Ideas to Navigate the MBA Waitlist. What separates you from every other glad hander on the waitlist hankering to get an invite into Admit Weekend?! Chocolate. I think sending chocolate as a proactive thank you gift pretty much qualifies as value added follow-up. Me? !, I send flowers to men but that is how over the top I am. It takes brass balls for men to send men flowers. -3- Work the Facebook Party. When you met interviewers, did you add them on Facebook? Ok, you did but did you work them with Facebook gifts afterwards? Working a facebook party is something I blogged about in vivid detail here. Sending them a facebook gift is better than that handwritten note you sent. Business is uncertain and people who see past the fog of war (or the haze of admissions) make better decisions. If we can set aside the emotional component, that is coupled with uncertainty, our decision making ability improves. Extra credit if you have the stomach to show up in person and deal with the volatility of an in-person rejection (see bonus tip #11: Show Up). -5- Donate To Their Alum Fund. Remember, an MBA is gonna cost $140k. Lets ante another $4k (four schools alum programs at a 1k clip). Really rich families donate to schools they want their kids to attend. 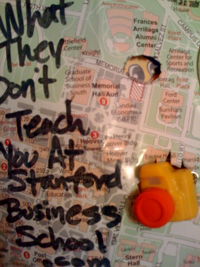 I’m taking apps to lend you $1000, but you’re gonna have to owe me a lot of page views for my blog posts and your vig will be co-writing material for the sequel to “What They Don’t Teach You At Stanford Business School” called “What They STILL Don’t Teach You At Stanford Business School”. A vig is slang for interest payments. -6- Commit to Your Reach School. Everyone wants a golden VIP admit. Academics lean toward a solid ‘yes’ from their safety school. Captains of Industry commit to their reach school. If I were an assistant to an admissions officer, I’d game the waitlist manuver and shop for smart, hungry and enthused applicants and migrate them up from the waitlist. -7- Leverage B-School’s Free Community Offering(s). I live in Palo Alto and at PACC (Palo Alto Community College aka GSB, aka Stanford Business School) they always have community business class offerings. Some are online and many are free. Just because you are waitlisted doesn’t mean you have to wait to educate yourself. 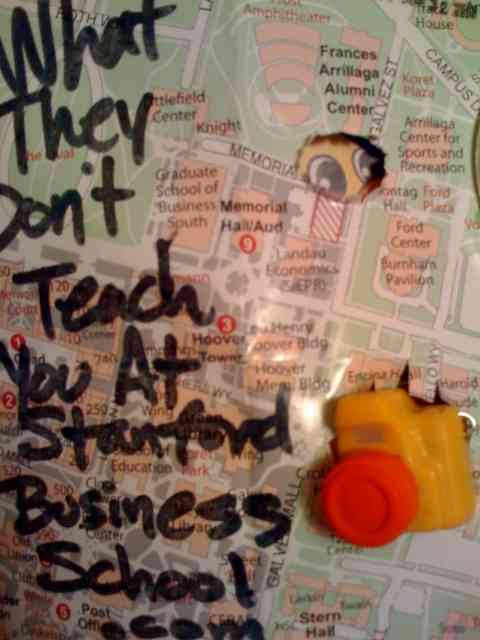 Maybe you can make a positive impression on a BJ Fogg / Dave McClure style Stanford instructor and milk a recommendation after crashing their classes. Bonus #8 – Your Educational Goal is Redaction. Redaction is a fancy term for when you drop out from an advanced degree. There’s a direct correlation between quitting b-school and being successful. Redaction often occurs between your 1st and 2nd year. It happens when you’re presented with a time sensitive opportunity that forces you to quit b-school. Redaction is similar to a college basketball lottery pick that leaves college early to go pro. We don’t stay in our MBA to bypass great offers. Bonus #9 – Don’t Pour More Money Down the GMAT Test Prep Hole. The holy grail of people that sell test prep is “another 40 points”. Spend you money instead hiring a feng shui specialist to doctor your shakras so that you sit in the maximum energy vortex at your next test taking facility. Sound hoo-la-ba-loo? It is, but so is spending time, money and time for 15 extra points. I said time twice cuz it takes a lot of time. Bonus #10 – Back-Channel Communicate. We don’t want to exhaust the admissions office with our letters, flowers and chocolate. Here are some back channel communications to get you on the admissions radar and transition you in from the waitlist. – Write a glowing review on Yelp. – Post positive Facebook notes. – Blog about your waitlist status. These back channels are monitored by schools and their keywords show up in their google s and our goal is to boost our stock by indirectly complimenting the program we are trying to gain entry into. Bonus #11 – Show Up. It is much harder to get rid of a warm body. You can choose to crash Admit Weekend or the first day of classes. Take advantage of the statistical fact that a dozen people who were admitted and commited don’t actually show up (and all of the waitlisters infront of you have scattered in the wind of their backup choice). Two stats to keep in mind. – Half of life is about showing up. – 70% of the time, it works every time. EXERCISE: Go From a Solid Rejection To Maybe. Take one of those MBA rejection letter(s) and get ON the wait list. Email me and I’ll help you love the waitlist too. QUESTION: Larry, if these are so easy to do, why doesn’t everyone do them? Answer: They’re easy to do. But they’re easier not to do. I think it’s because failure feels bad. I think getting waitlisted feels like failure and people don’t address failure strait on. Larry’s book releases 09-09-09 and is on the waitlist to get onto the bestseller list. Larry Chiang is the founder of Duck9, which educates college students on how to establish and maintain a FICO score over 750. He has testified before Congress and World Bank on credit. He is a frequent contributor to Business Week’s blog on “What They Don’t Teach You at Business School“. For fun, Larry blogs, attends tech conferences and hoops it up at Arrillaga Family Center. Text or call him during office hours 11:11am or 11:11pm PST +/-15 minutes at 650-283-8008.